SparkysWidgets has released a newer version of the miniEC (product page) since I last played with this breakout board. I ordered some of the newer versions awhile back and am finally getting around to giving the miniEC circuit a twirl! The goals of this post are to identify confusions I have with the 2nd stage (Gain stage) of the miniEC circuit. Ryan (SparkysWidgets). 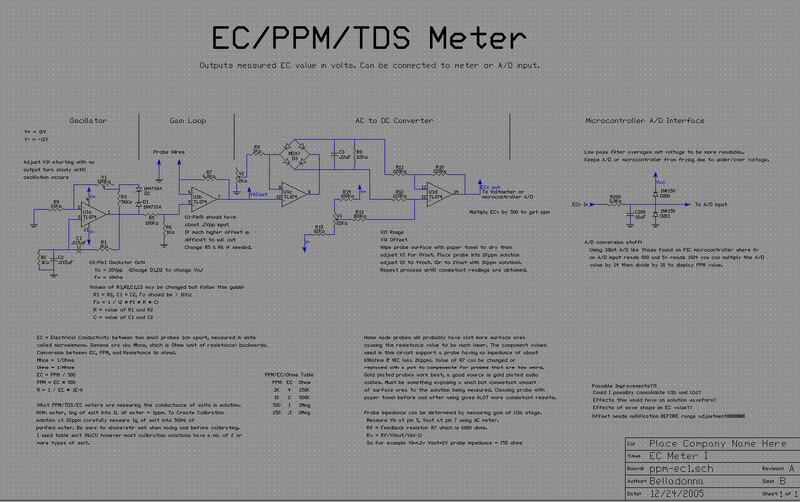 Ryan provides the miniEC (product page) as well as the schematic and board layout (GitHub files). Chris Gammell. For his excellent Contextual Electronics course – I learned A LOT about electronics, schematics, board layout, and soldering. Chris is an amazing teacher who I continue to learn from. Right before the 2nd stage, this wave is turned into a small signal(about .2VPP via voltage divider) this small signal is passed into the (2nd stage) gain stage where the eC probe forms one leg of the gain divider of the op-amp By treating the SUT as an unknown resistance in a gain loop the amount of current needed to calculate the conductivity is decreased by several factors(at least a 100x reduction). However, I checked the chips…. I am finding a big difference between hardware and software development is when attention to detail kicks in. With hardware, I find attention to detail is extremely important early on. For example, soldering an SMT given my skill set. The extra time I take to clean the pads, place the chip in a way that I don’t have to handle the PCB while trying to put hot solder on a pin/pad, making sure to apply flux, cleaning off the residue after soldering is time well spent. If I don’t do this, I end up removing and re-soldering…removing and re-soldering…With that said, even with all the prep, there are many times when my soldering needs to be redone…particular on iddy biddy sized parts. and checked the resistors with their values on the breakout board. R7 on the schematic calls for a 100KΩ resistor. The value on the board is 47KΩ. R9 is 1KΩ on the schematic but on the board it is 3KΩ. the VPP into the gain op amp is too small – doing the calculation: .9*(1/101) = .008V! I think this was a typo. If the VPP is to be .2V, and R7 = 100K, then a value for R8 that will create a .2VPP is 30KΩ. The right answer will depend on the results for the E.C. Is the value within range of those given by the EZO or TDS meter? That’s something I need to find out. is acting as a value for an E.C. reading (see this post for an explanation). an R value of 200Ω is equal to an E.C. reading of 5mS. When R9 is 1K, the Gain is 1+ 1000/200 = 6.
which is “close enough” to the LTSpice IV results. By knowing the Gain, the E.C. can be back calculated. When R9 is 3K, the Gain is 1 + 3000/200 or 16. So 16 = 1+3K/R0 -> R0 = 3000/15 = 200 Ω E.C. = 1/200Ω = 5mS. Given the relationship between the resistors and the Gain, the variable resistor (R0 – representing the probe in the LTSpice model) means the Gain will vary based on the conductivity of the bath. The challenge then is to determine a resistor value for R9 that is within +5V and is “large enough” to get “the best” reading it can. I’m thinking a good value for R9 is around 4K. This way, the Vpp is within 5V. I need to figure out what the “best” values for the resistors are. This is probably best done using a bread board prototype. I’m still having trouble prototyping the Wien Bridge Oscillator. I think my “big mistake” was using a single power supply. There is some learning gap that I must bust through to get this going. I should also receive the Healthy pH Shield PCBs this week. Once I receive these I will solder on the parts and give this rev of the Shield a twirl. Today as always – please find many things to smile about. This post is a follow up to this post – where I dissected SparkysWidgets’ minieC circuit. While this is a short post, It is important to thank exceptional folks whose sharing of their knowledge has greatly benefited my learnings. @SparkysWidgets – Thank you for your help. You have been inspirational. if you are interested in this stuff, PLEASE check this person out! I will be borrowing heavily from the minieC product and schematic. The person behind this wonderful post on the electronics behind an EC sensor. Chris Gammel – our very knowledgable and gifted instructor of Contextual Electronics. A course I would highly recommend if you are interested in turning your prototypes into PCBs and learning tons about electronics along the way. The more time I spend with Chris, the more I realize what an exceptional person – both in knowledge and in ethics – he is. Chris is amazing at clarifying circuit concepts! I brought this up with Chris during our Google Helpout (note: I do not get paid for endorsing Chris – quite the opposite – I get a lot of value from Chris and hence pay him – you can sign up to talk with Chris via a google help out. The link is here). Chris asked that I try several values for C7 and then several values for R10. I tried 10pF, .1µF, 1µF, 10µF, and 50µF. I ran the simulation twice. The first time R0 – the substitute for the E.C. Probe – was set at a resistance of 200Ω. This is about the resistance I would expect for a tomato nutrient bath. The second time the resistance of R0 was set at 1000Ω – what I would expect for the nutrient path if the plant was lettuce. As expected, the waveform smoothed out as the value of the capacitor got larger. The 1µF capacitor is what is used in the minieC design. The 10pF looks too noisy. As R0 got larger, the smoothed out voltage value began to give a larger value. Given this, 1µF seems like a “best” fit for this design scenario. The next LTSpice simulation I ran was to keep the capacitor at 1µF and plot R10 values for 100Ω, 1KΩ, 10KΩ, and 100KΩ. Given the results, it looks like Sparkyswidgets’ choice of 10KΩ for R10 makes sense. That’s it for now. A simple update to share my LTSpice results to determine the “best” values for smoothing out the DC current going into the ADC without smoothing out the value too much. It looks like the choices made were the right ones.